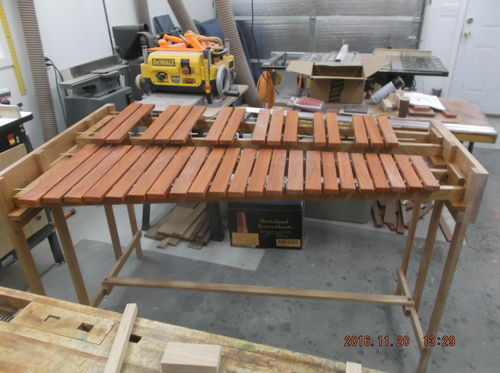 I have all Christmas presents ready and time to work on the Marimba again. When I left last I had moved the lower keyboard over an 1 1/2 for clearance. After final tune and drilling the keys I didn’t like the gap so I moved everything back an 1 1/4. It looks way better. I applied one coat of lacquer. The final. Keys are closer to the upper frame and just looks better. I need to quit over thinking these things. Time to rough tune the keys. the keys were cut to width and length earlier and set aside while I cut and assembled the frame. 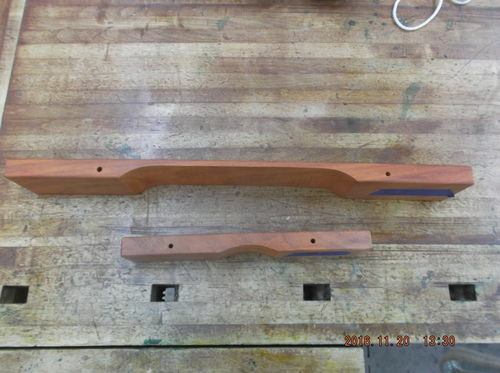 To tune the bars you remove material from the underside of the bar. I marked the center of the bar and went to the oscillating belt sander. 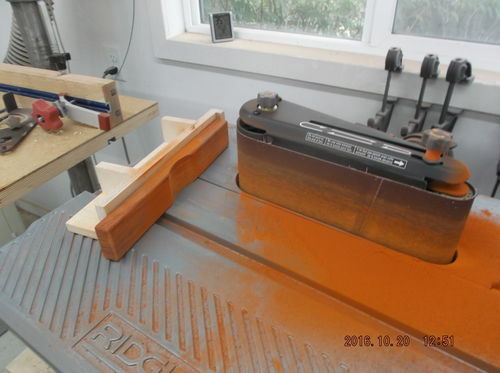 This is where the Ridgid oscillating belt really outshone a oscillating spindle sander. 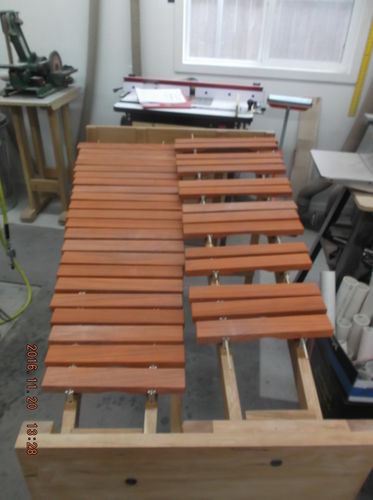 I started with an 80 grit belt and went for a rough tune approximately 20 cents sharp. Then I can bring the final tune down after letting things set for a few days and getting the bars drilled and ready to suspend. When tuning when you get within one percent of the note frequency the last percent is divided into 100 centsat 20 cents sharp you are actually .2% away from away from the final note frequency. You end up really close supposedly the human ear can hear a difference of 2 cents. I can’t. The joy of working with padauk. I like padauk but when sanding the masks come out. I had to build a jig to hold the bar vertically to take material off evenly. Once the center of the bar was marked. I just eyeballed things and worked both ways about the same distance. I did have to make a second jig as the first wasn’t long enough when I got into the lower notes. The author recommended starting with the lowest not moving up. After the Glockenspiel I started with the highest note and went down. I had to remove very little for the first note then just a little more for each one after that worked better for me. Here is the difference in material removed. The short key is high C6 the long key is low C3. 37 Keys total 22 on the main board and 15 on the sharp board. At this point everything is tuned to within 20 cents. Time to start on the resonators. Very difficult task. Anxious to see how you come out with pitch and tone. Looking good. What instrument did you use to get the right pitch? A lot of material has to removed on the lower key. Is this normal, or in other words has it also to do with the used wood. I.m looking forward to see the tubes. Got have a sound video of this one please…. I ended up with an electronic tuner app for my kindle fire called DATuner Pro. It works really well. 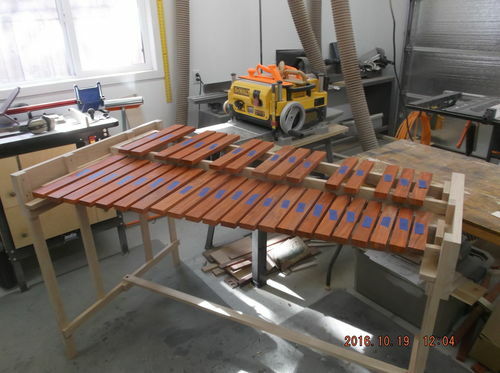 The wood used dictates the amount of material removed but that is probably about normal for any of the “musical” woods.